Over the course of running the site, we’ve reviewed a number of speakers, but generally they tend to be the mini ‘put in your pocket’ type. 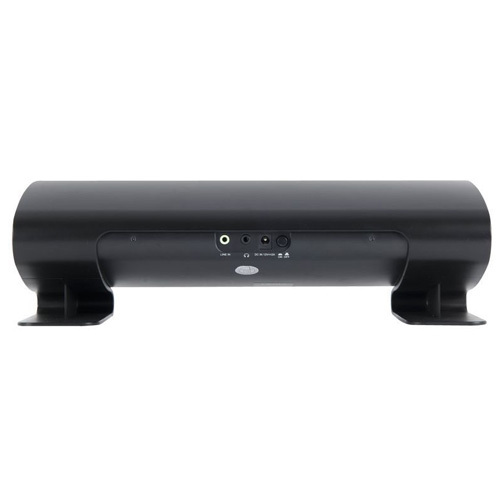 The Xenta LT-201 Bluetooth 24W Speaker sent to us from Ebuyer is designed as more of a living room or kitchen device. Still pretty portable, but not the sort that you’d take away on holiday with you. It retails at around £40, so is really an entry level speaker of this type, but that’s not to say it doesn’t have the goods where it counts. Setting up the Xenta LT-201 is really straightforward. Turn it on, set your phone or tablet to scan for devices, and connect. No need to punch in passcodes, or other messing around. It really couldn’t be easier! I had it up and running and streaming music within a couple of mins of getting it out of the box. The front of the unit has a large, centrally place volume dial. There’s also ‘stop/play’ and ‘skip track’ buttons, assuming the device you’re playing from supports those features. The rear of the unit has a ‘line in’ socket, should you wish to connect something directly to it, and a headphone jack (although i’m not entirely sure why you’d need it, but at least it’s there if you do!) There’s also a blue LED indicator light which flashes to show when a device is connected. I can see why they’ve done that for some visual feedback, but it is a little annoying if you’re in a darkened room. 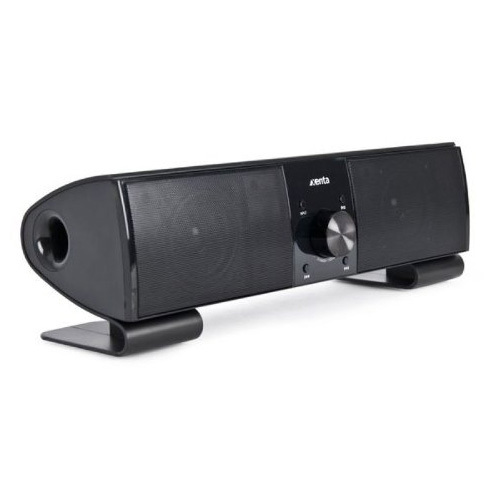 For a relatively small speaker, it packs a decent punch, allowing you to crank up your tunes to fill most decent sized rooms without any real distortion. Given it’s really an entry level speaker, the sound quality is pretty good. The bass could maybe do with being a little ‘bassier’, but I thought the top end was fine for the size and price, and they do a very acceptable job. Obviously, the speaker is one unit, meaning there isn’t a huge separation between left and right stereo, but then that is to be expected with this sort of speaker design. I had no issue with the range at all. I found I could happily wander around the house with the phone in my pocket without any breaks in the Bluetooth connection. I was even upstairs at one point, and the LT-201 was still happily streaming away. Overall, the Xenta LT-201 is a good speaker at a reasonable price. If you’re looking for a good little Christmas gift, or just something to let you stream your tunes to your kitchen or your bedroom, this will do it perfectly well, and won’t cost you a fortune. 8/10 – Good speakers at a good price point. ← New ‘Movie-Style’ Trailer for J.H. Wyman’s Almost Human!